Step it up and get in great shape. A motivational class using a platform and fast music for a high intensity workout. It’s so much fun; you’ll forget you’re working out! Better for: Cardio fitness and conditioning of the whole body. GROUP CYCLE: Wednesdays 19:00 - 19:45 with Paul. Pedal your way to fitness. 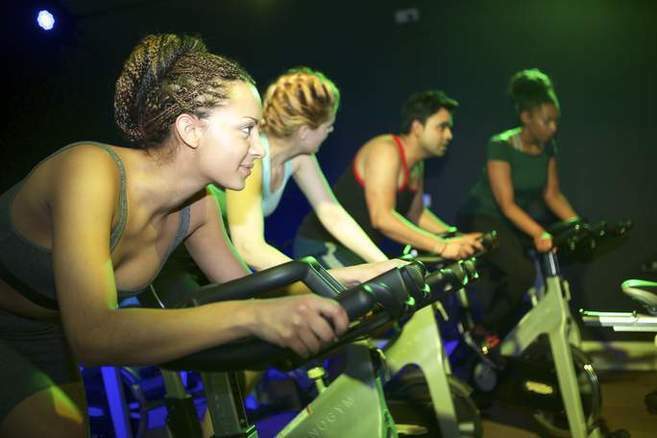 Work at your own pace as you cycle along with the group in one of our themed classes to uplifting music, or focus on achieving your goals in one of our discipline based classes. Better for: Lower body strength and conditioning. Approx. 560 calories per hour. Approx. 420 calories per hour. Extreme Interval Fitness: Fridays 17:45-18:45 with Danielle. Combining a high-intensity workout with muscle conditioning that stimulates a higher caloric burn. Every exercise is driven by the music, helping you make it to that last rep.
Approx. 570 calories per hour.